GrafX2 is a bitmap paint program inspired by the Amiga programs ​Deluxe Paint and Brilliance. Specialized in 256-color drawing, it includes a very large number of tools and effects that make it particularly suitable for pixel art, game graphics, and generally any detailed graphics painted with a mouse. The program is mostly developed on Haiku, Linux and Windows, but is also portable on many other platforms. Features? Screenshots? Downloads Documentation Contact? Older news are archived here?. 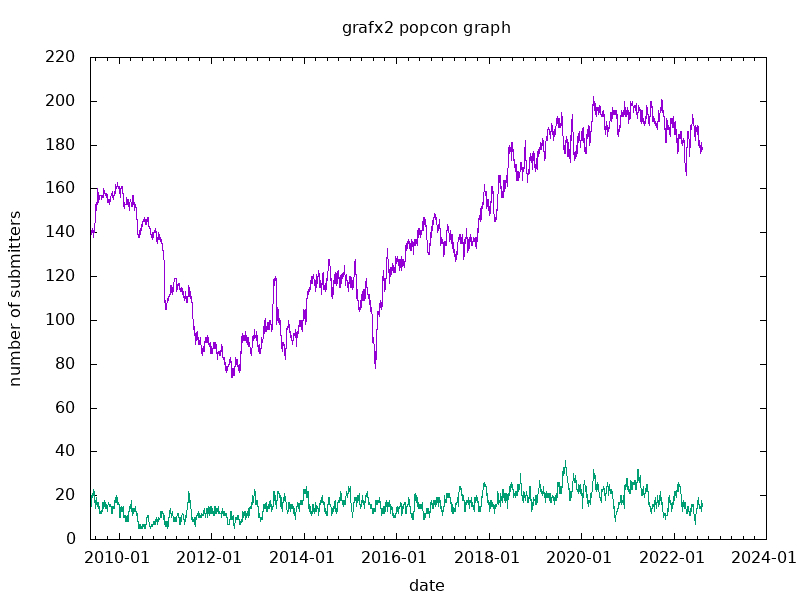 Debian popcon statistics : People who have it installed in red, frequent users in green.